Cooking fish in parchment paper, or en papillote (pa-pee-YOAT) if you’re French or just fancy, is a simple way to get a delicious meal on the table in minutes. If you’re a beginning cook, this is a foolproof way to cook fish properly. Technically, cooking en papillote is a form of steaming. 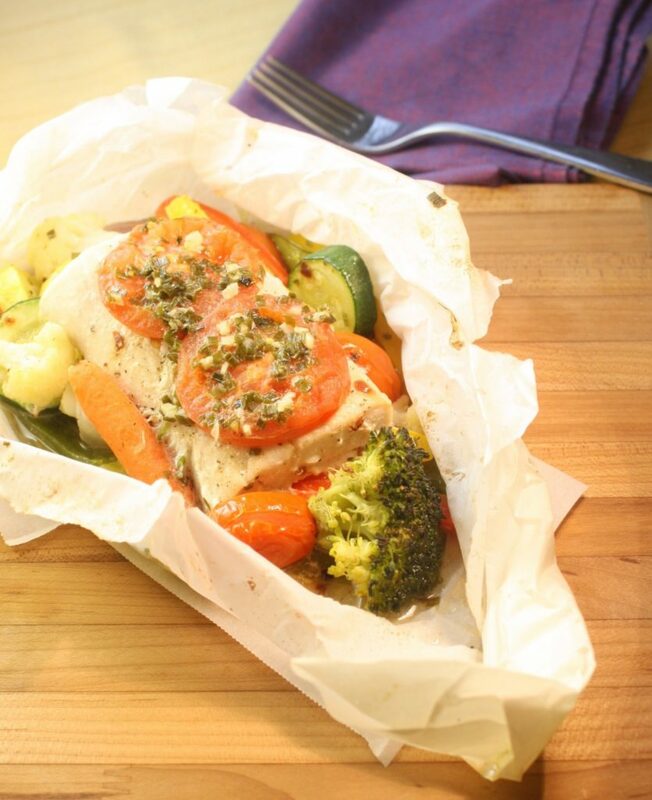 By wrapping your fish and veggies tightly in parchment paper and popping them into the oven, heat and steam build up inside your parchment package and cook your food. The goal – fish that’s flaky yet still moist. Add fresh veggies to the mix and you’ve got a full meal in one neat and tasty bundle. Learning to cook fish in parchment is a seriously simple technique that will help you get a delicious meal on the table in minutes. Steamed fish and veggies on their own might bring to mind bad memories of soft, tasteless hospital food but throw in fresh herbs and your favorite compound butter and you (and your guests) are in for a treat. Mahi Mahi is a mild, white fish that is perfect for steaming. A sprinkle of crushed red pepper flakes and a dab of Garlic-Chive butter give the fish and veggies a fresh mix of flavors. Don’t feel like chopping veggies? No worries! Pick up a package of prepped vegetables – they’re usually labeled Stir Fry or Steaming vegetables – from your grocery store’s produce section. Serve this with a piece of crusty bread or rolls so you can soak up the delicious sauce you’ll find inside. 1. Choose fish filets that are no more than 1-inch thick. Anything larger and you run the risk of ending up with unevenly cooked fish. 2. Chop fresh veggies so they’re all about the same size so they’ll cook in about the same time. Cut denser vegetables, like carrots and potatoes, into smaller pieces so they’ll take less time to cook. 3. Make sure your parchment paper heart is large enough to hold the fish and veggies. 4. Season your fish and veggies well. This is your one opportunity to bring out their best flavor before they’re cooked. 5. Add a dab or slice of your favorite compound butter to your package before you seal it. As the butter melts it will add flavor to both the fish and veggies. 6. Fold the edges of your parchment package tightly to keep steam trapped inside. If it’s not sealed tightly, the steam will escape and your fish will not cook properly. 7. Let your packages rest for 5 minutes when you remove them from the oven. 8. Use scissors or a sharp knife to cut a slit in the top of your bundle. Be careful of any remaining steam trying to escape. 9. Be sure to use only parchment paper, not wax paper. Wax paper’s wax lining is not suited for high oven temperatures when it’s surface is not completely covered. 10. Serve your fish and veggies directly from the parchment or transfer the food from the parchment to a plate. Place butter in a medium bowl. Add remaining ingredients and stir until well-combined. Place butter on sheet or parchment or plastic wrap. Use the parchment or plastic wrap to shape the butter into a log and wrap it tightly. Chill until firm, about an hour. Fold a large sheet of parchment paper in half. Cut along the seam to create half a heart. Unfold parchment heart and place on baking sheet. Place vegetables in a medium bowl. Drizzle with olive oil, crushed red pepper flakes and a big pinch of salt and pepper. Place half the vegetables one one side of each parchment heart. Season fish with salt and pepper and place one fillet on top of each mound of vegetables. Arrange two tomato slices on top of each piece of fish. Cut two slices of Garlic-Chive Butter, about 1/4-inch thick and place one slice on top of each piece of fish. Fold the parchment over and tightly crimp the edges to seal your heart tightly. Repeat with remaining fish filet. Bake 15 minutes. Remove from oven and let sit an additional 5 minutes. Use scissors or a sharp knife to cut open the top of the package. Watch out for the steam!